Stories-memories (synchronously) writer NI Ilina, composer O.Lundstrema historian G. Melikhova about his childhood and adolescence, which took place in China, Harbin - center CHIN (Chinese Eastern Railway). 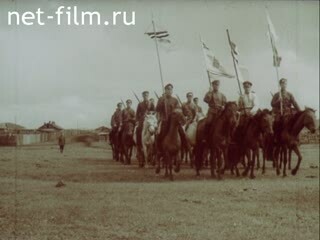 Japanese, Chinese, Soviet newsreel about the life of Russian immigrants in Harbin. Photos from family albums movie heroes, their families, various years. There is a passenger train. Scenery outside the window of the car. Newsreel of 1920: the passenger car in coupe Chinese Eastern Railway (CER). Newsreel 1920: is a passenger train. People at the train station in Harbin, is a police officer. GV Melikhov, A. Lundstrom, NI Ilyina watching an old newsreel footage Ilina comments (synchronously). Newsreel, 1920: Russian gymnasium school in Harbin. Pupils of the "Russian House". GV Melikhov He tells the story of Russian emigration in Harbin (synchronously). Photo and alumni of the Polytechnic Faculty of Oriental Studies of the University of St.
Vladimir in Harbin in 1937. Group photos of Russian immigrants - the representatives of different professions period of 1930. Newsreel 1920: Cossack emigrants in the field in a cart cook food, while development in the Three Rivers district Argunskom China. People eat, sitting by the fire. Girl gets on the horse. Harvest using a horse mower. Moving team of horses and oxen. Forms of Cossack village in northern Manchuria. Cossack carries the cart cans. The family at the table during dinner. The young man dancing in a circle to the accordion. Girls watching a dancer, smiling. People are dancing to the accordion during the festival in the village. Cossacks from the banners are riding. Cossacks demonstrated the attack on horseback. Russian peasants and Cossacks dancing to the accordion while relaxing on logging. People playing on the balalaika, moonshine drink. Historian Melekhov GV He sits at his desk (synchronous sound memories Melikhova). Book cover Melikhova sheet with the characters in his hands. Photos Melikhova and his family album. Photos Melikhova grandfather from the mother. Newsreel 1920: horses and cows grazing in a meadow in Three Rivers. Herd of cows walking along the street stanitsa. Chickens sitting on a brick wall. Birds fly over the pipe at home. General view of the house. Photos Melikhova in school and college years. Newsreel, 1920: Buddhist monks perform religious rites. Execution of Chinese folk dances. Manchurian peasants arats Mongolian camel. Caravan of camels in the desert. Newsreel 1920: scenery outside the window of the car. 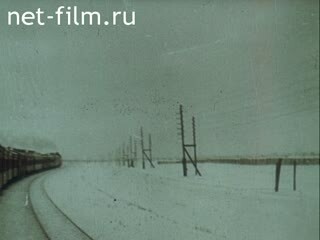 View from the window of a passenger train locomotive. Conductor Lundstrom OL is preparing to go on stage (synchronous sound memories Lundstrem). Lundstrom emerges from the dressing room. Lundström takes the stage, welcomed the musicians and the audience. Photos Lundstrem in early childhood. Photo Lundstrem with his parents and brother. Photos father and grandfather Lundstrem. Photos mother and grandfather Lundstrem another. Photos Lundstrem while studying at school. Newsreel, 1920: boys beat the bell ringers. The Orthodox Church in Harbin. Parishioners of the church, the priest leaves the altar. Choir sings (synchronous sound memories writer Ilyina NI). A priest from the church book. People in the church during the service. Type part of one of the churches. The priest and the deacon out of the altar. People come by turns to the priest and kiss the icon. Photos of parents in the family photo album Ilyina (synchronous sound memories Ilyina). Photos Ilyina in childhood and adolescence. Ilina book "Roads and destiny." Ilyin sits on a sofa at the table, smoking. Photo grandmother Ilina Voeikov OA and her relatives. Photos Voeikov with family Ilyin. 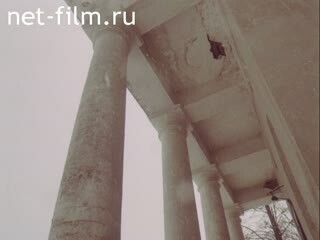 Photos of the interior of the house on the estate Voeikov "Samaykino." Ilina Leafs family photo album. Photo Russian climatologist AI Voeikov Ilina Leafs family photo album, a portrait of her cousin Tolstoy EV on the wall. Park and house in the former estate "Samaykino." The view from the windows of the house. Horse gallops through the snow. Chapel, birds' nests in the trees. Newsreel 1930: types of streets in Hailar. Street clerk at the desk. Children playing in the dust in the street. People on the street playing checkers. A sign of the railway station with the inscription "Hailar". Train coming to the station. People at the fence watching the train. Passengers look out from the windows of the car stopped. The train is moving, people go on the platform. Street shoe shiner at work. Women and children sitting on the bench. A girl milking a cow. Representatives of the local peoples in their national costumes. Flock of sheep moving through the city. Streets Hailar and Manzhouli station in winter. Types of suburban houses Harbin. People are talking, standing near the fence. People walk through the streets past the houses. People walk on the square in one of the suburbs of Harbin. Ilina talks about life in the city (synchronously). Panorama Winter Park, home to the depth. General view of the church building. Forms of the park from the house. Old photographs on the floor terrace. Ilina continues the story (synchronously). Newsreel, 1920: Street in Harbin. GV Melikhov Commented newsreels (synchronously). Newsreel, 1920: Panorama of the Harbin Railway Station. The building management CEL drives the car. Chairman of the Board of CEL Ivanov AN His deputy, Yuan Jin-Kai. Ivanov talks with members of the Board. Members of the Board of CEL down the stairs. Soviet officials CEL. Children Soviet officials with Chinese children. Ivanov gave a report Karahan LM after his arrival in Harbin, Karahan greets employees. The building of the Board of CEL in Harbin. Building Commercial School in Harbin. Square in front of the Board. Building trade representation of the USSR in Harbin. People walk past the building. Buildings on the streets of Harbin. House Krol on Girin street where originally housed the Soviet consulate. The building of the "House of the working people." The building of the Harbin branch of Dalbanka. Cars on the streets of Harbin. Rickshaw pulling a cart on the street. Lundstrom and Ilina Watch and comment newsreels, sitting in the auditorium. Newsreel of 1920-1930: the face of a Chinese soldier. Entrance to the building of the hotel. 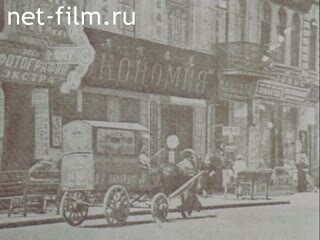 Russian shops in the streets of Harbin, with advertising sales. Photos streets of Harbin 1930s. Photos reflecting the life of Russian Harbin. Newsreel, 1930: People on a boat ride in the park of Harbin. The bridge in the city park. People relax in the city park of Harbin. Pond in the city park. People sit on the banks of the Songhua River, the ship sails past. Steamships and other vessels on the River Songhua. Steamship floats on the river. View of the river bank. GV Melikhov It tells the story of Harbin (synchronously). Lundstrom OL It tells the story of Harbin (synchronously). Newsreel, 1936: Panorama of the channel-Su Kyaw in Shanghai. Buildings on the waterfront of Shanghai. Junks and sampans at the waterfront, people on junks. Rickshaw on the streets of Shanghai. People walk through the streets, passing cars and rickshaws. Cars and trams on the streets of Shanghai. Sikh on the streets of Shanghai. Sikh stands at the crossroads. People on the streets of Shanghai. The building department, "San San". Ilyina NI gives interviews (synchronously). Photo of the editorial staff of the newspaper "New Life". Photos Lundstrem between life in Shanghai. Lundstrom talks about his return to the USSR (synchronously). Melihov talks about his return to the USSR (synchronously). Types of park and country house, it is snowing. Ilyin speaks of returning to the USSR (synchronously). Winter landscape with frozen river. Frozen River, rises on the banks of the Orthodox church.